Contains the raw data and optional geo-location information. Contains a dataset ending in "Aggr" with references to objects in the /All_Data group. Contains granules (datasets with a name ending in "Gran_#") with references to selected regions in datasets under /All_Data. 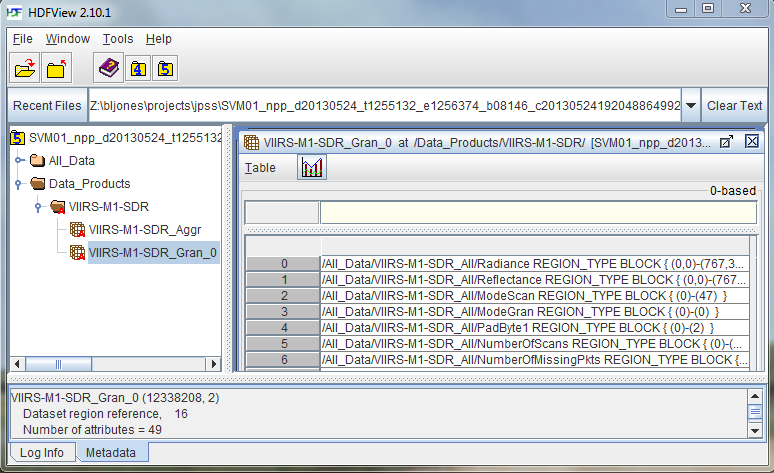 In the output above you can see that there are four granules (ending in Gran_#) in the /Data_Products/VIIRS-M9-SDR/ group. With h5ls you can see a list of the objects in the file using the -lr options. 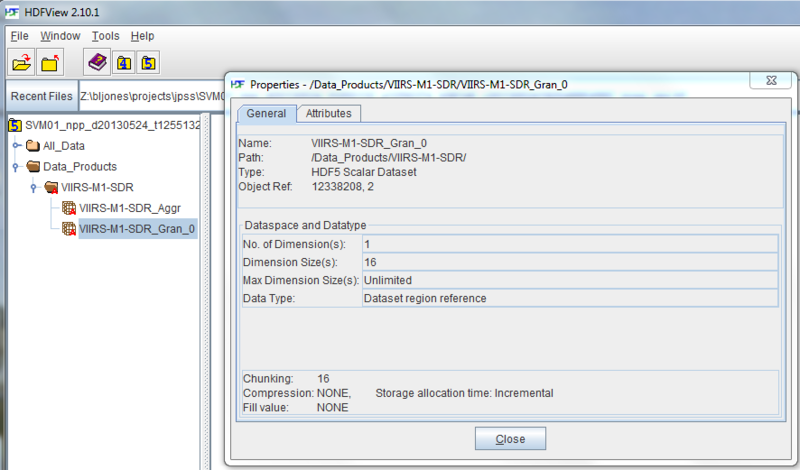 The h5ls utility also shows shape and size (dataspace) information about datasets. Note that the Inf indicates that those datasets are appendable or unlimited in size. If you click twice with the left-mouse button on a folder or group in the TreeView, the contents of the folder will be listed. If you click twice on an object such as a dataset, a window with the object's values will be displayed on the right side of the HDFView screen. 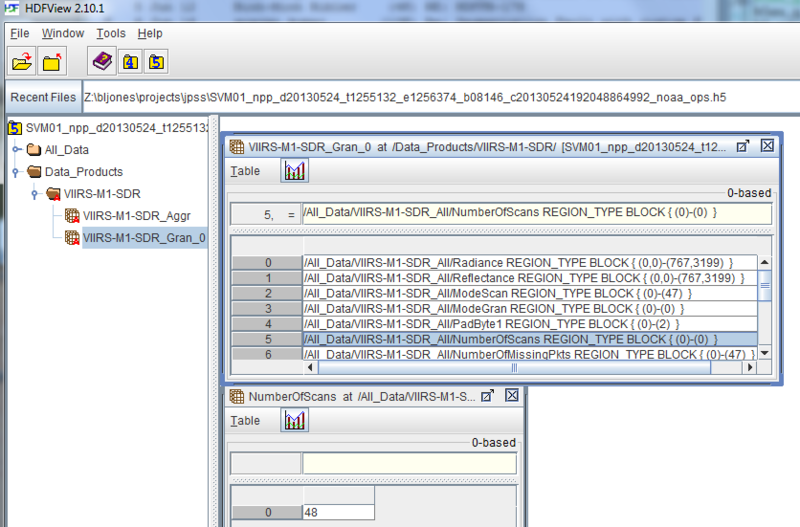 Underneath the VIIRS-M1-SDR folder are what HDF5 calls datasets. The scarlet letter "A" attached to the group and datasets under Data_Products/ indicates that there are attributes associated with them. All JPSS files contain a user block in XML with information about the file. The user block is an optional space allocated at the beginning of an HDF5 file that is not interpreted by the HDF5 library. Its size is a multiple of 512. The input HDF5 file remains unchanged. The output HDF5 file will not contain the user block. The UB.xml file contains the user block which can be viewed with a browser. There are Unix tools for Windows that may work, such as CoreUtils for Windows. h5dump -H -A 0 -d "/Data_Products/VIIRS-M9-SDR/VIIRS-M9-SDR_Gran_0"
h5dump -A 0 -d "/Data_Products/VIIRS-M9-SDR/VIIRS-M9-SDR_Gran_0"
What if we wanted to look at the NumberOfScans data for a specific granule in a file? First, we may be interested in determining whether the scans were done at night or in the day. If a scan was at night, there will be no data. The attribute N_Day_Night_Flag is used to determine when the scan was done. If you don't know where this attribute is located, you can use the -N option to search for it in the file. If you were to run this command on the SVM09 file used above, you would see that the N_Day_Night_Flag attribute has a value of Night for the four granules in the file. Indeed, if you actually examine the NumberOfScans data, you will see that only fill values are written. $ h5dump -A 0 -d "/Data_Products/VIIRS-M1-SDR/VIIRS-M1-SDR_Gran_0"
In the output above, you can see that the NumberOfScans reference is the sixth reference in the granule counting from the top. The list of references shown above is a 0-based index to the dataset. Therefore, to specify NumberOfScans, enter a start offset of 5 for the -s option (the sixth reference minus 1). To see the region reference data, use the -R option. The -s option may be familiar as one of the options that was described in the Dataset Subset tutorial topic. The other subsetting options are not included, indicating that the default values are used. The quality flags in an NPP file can be viewed with h5dump using the -M option. Quality flags are packed into each integer value in a quality flag dataset. Quality flag datasets in NPP files begin with the letters "QF". For example, bits 0 and 1 in the QF1_VIIRSMBANDSDR dataset specify the flag that "Indicates calibration quality due to bad space view offsets, OBC view offsets, etc or use of a previous calibration view". It has 3 values: Good (0), Poor (1), or No Calibration (2). The -p option shows any compression filters associated with a dataset, as well as layout and fill value information. This option can be helpful in diagnosing performance and other issues. $ h5dump -p -H -A 0 -d "/All_Data/VIIRS-M1-SDR_All/Radiance"
We can see that the chunk size for this dataset is 768 x 3200, and the storage size is 4915200. What if the chunk size were smaller? The dataset was modified to have a chunk size of 1 x 10, using the h5repack utility, as shown below. In general, the smaller the chunk size, the more chunks that HDF5 has to keep track of, which increases the size of the file and can affect performance. 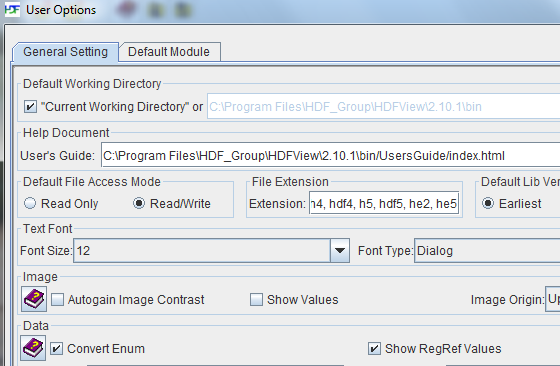 As mentioned previously, the structure of an HDF5 file is displayed in the TreeView on the left side of the HDFView screen, and you can click on objects and have their values displayed in a window on the right side. You can view and set quality flags by clicking the right mouse button over a quality flags dataset under All_Data and selecting Open As from the pop-up menu. In the right corner of the window that pops up, you will see where you can specify Bitmask options.